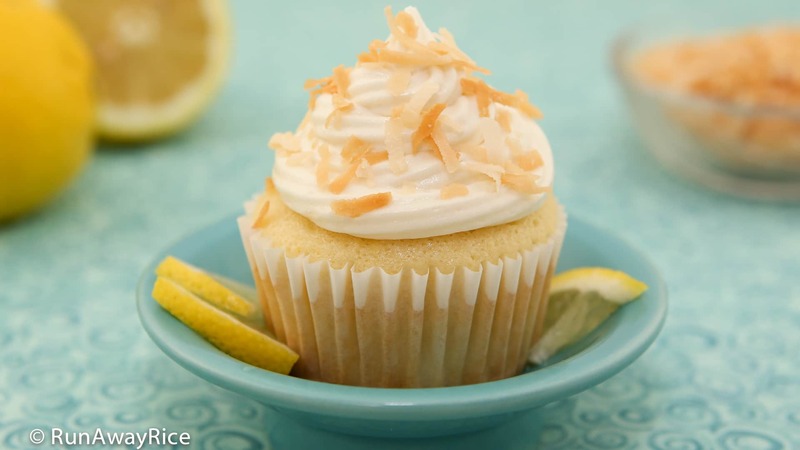 This recipe for Lemon Coconut Cupcakes combines the best flavors of summertime into fluffy cupcakes that are perfectly tangy and sweet. 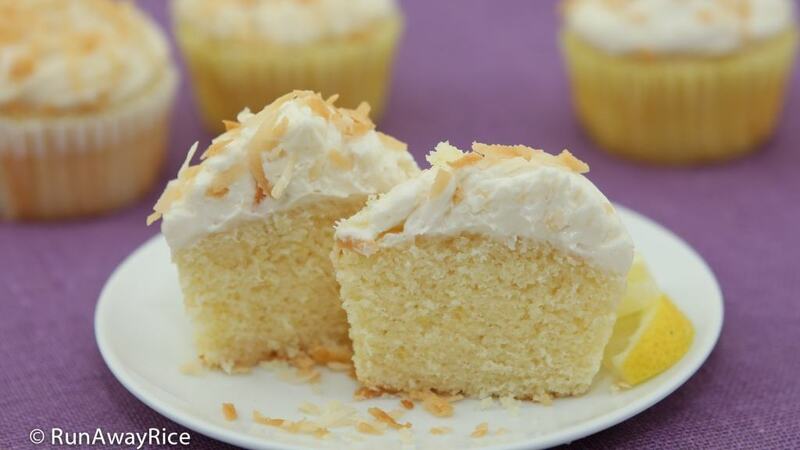 Fresh lemon juice and zest add zing to these moist and spongy cupcakes. The velvety frosting is sweet with the just the right touch of tartness from the cream cheese. 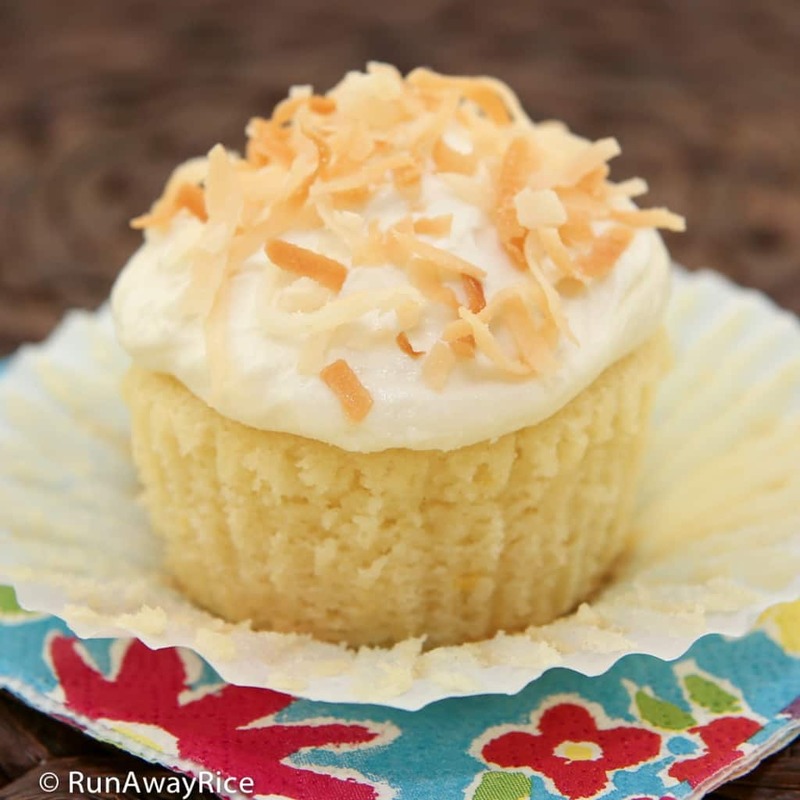 Topped with toasted coconut flakes for a deliciously crunchy texture, these Lemon Coconut Cupcakes are decadent sweet treats and so easy to make. 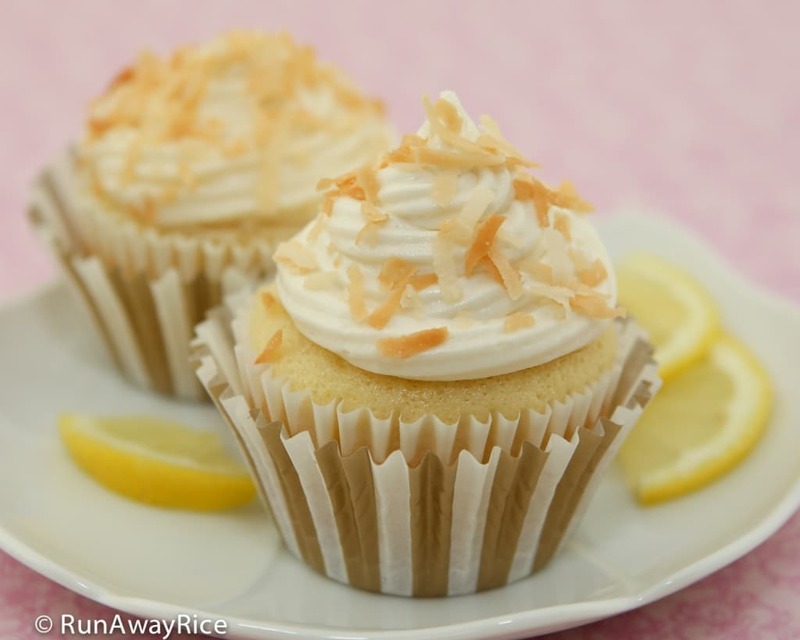 These Lemon Coconut Cupcakes are wonderful desserts for your summertime parties and get-togethers. Their uniquely tart and sweet taste is sure to leave your guests wanting more. For a special treat, serve the cupcakes chilled. They’ll be wonderfully cool and refreshing on a hot day. Enjoy! Use a large lemon for this recipe. It should yield 1/4 cup lemon juice, but if less, add water to equal 1/4 cup. Lemon extract is also an acceptable substitute. Use 2 tsp lemon extract and add an additional 1/4 cup milk. 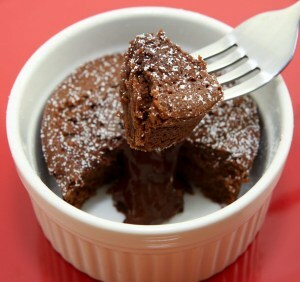 Make your own cake flour as follows: Measure 1 cup all-purpose flour. Remove 2 Tbsp all-purpose flour and replace with 2 Tbsp corn starch. Sift the ingredients together. You now have 1 cup cake flour. Please note this recipe uses 1 cup plus 2 Tbsp cake flour. When making the cake flour, add an extra 1 3/4 Tbsp all-purpose flour and 1/4 Tbsp corn starch to make enough for this recipe. This batter is thin and that’s what makes the cupcakes fluffy and moist. 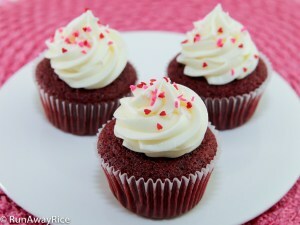 Avoid over-mixing the batter which may make the cupcakes tough or cause them to deflate after baking. After adding the eggs, the total mixing time should be less than 3 minutes. The cupcakes take about 20 minutes to bake. After baking for 18 minutes, check the cupcakes using a toothpick. If any cake sticks to the toothpick, return to the oven and continue baking. Check the cupcakes again in another minute or so. Do not over-bake or the cupcakes will be dry. The eggs, milk, cream cheese and butter should be a room temperature. Room temperature is approximately 68-72 degrees Fahrenheit (20-22 C). Remove the eggs and milk about 1 hour before starting the recipe. If in a hurry, de-chill the eggs in a bowl of warm water for 15 minutes and warm the milk in the microwave using Low power for 10-15 seconds. The cream cheese and butter take about 1 1/2 – 2 hours to come to room temperature. Do not let the cream cheese and butter get too soft as this will affect the consistency of the frosting and make it runny. Add more confectioners’ sugar if you prefer a thicker and sweeter frosting. If the frosting isn’t stiff enough to pipe, refrigerate for 15 minutes. These cupcakes are best enjoyed the day they are made. Store any leftovers in the refrigerator for up to 4 days. Cupcakes can be frozen for up to 2 months. The cupcakes and frosting can be made the day ahead. Store the cakes at room temperature and refrigerate the frosting. The next day, allow the frosting to come to room temperature before frosting the cupcakes. Optionally, whip the frosting using a hand mixer to make it fluffy. Line a 12-count baking pan with paper liners. Preheat the oven to 350 F (177 C). Use a zester to remove the bright part of the lemon skin. Set aside in a small bowl. Juice the lemon. Strain the juice to remove the pulp and seeds. In the bowl of a stand mixer, add the cake flour, sugar, baking powder and salt. Using the paddle attachment, mix on Low speed for 30 seconds. Add the vegetable oil and vanilla extract. Mix on Low speed for 1 minute. (Ingredients should look like a crumb topping.) Add one egg and mix on Low speed until incorporated, about 30 seconds. Scrape down the sides of the bowl using a spatula. Add the remaining egg and mix on Low speed for 1 minute. (The batter should be thick.) Add the milk and mix on Low speed until blended, about 30 seconds. Scrape down the bowl again. Add the lemon juice and zest. Mix on Low speed until just incorporated, about 30 seconds. Transfer the batter into the baking pan filling each well two-thirds full. Tap the pan against the counter a few times to remove any air bubbles. Place the baking pan into the center of the oven and bake for 18-20 minutes. Check for doneness by inserting a toothpick into one of the cupcakes. The toothpick should come out clean. Let the cupcakes cool for 5 minutes and then transfer to a wire rack. Allow to cool for at least 1 hour before frosting. Transfer the coconut flakes to a small baking pan and spread out into a thin layer. Bake in a toaster oven at 350 F (177 C) for a total of 8 minutes. After 5 minutes, stir the coconut flakes and continue baking. Stir the coconut flakes every minute for the remaining baking time. Transfer to a small bowl and set aside. In a large bowl, sift the confectioners’ sugar. In the bowl of a stand mixer, add the cream cheese and butter. Start on Low speed and increase to Medium speed. Beat until well-combined and fluffy, approximately 2 minutes. Reduce to Low speed and add the vanilla extract. Add 1/2 cup confectioners’ sugar and mix on Low speed until just incorporated. Continue adding 1/2 cup confectioners’ sugar every 30 seconds while mixing. After adding about half the sugar, scrape down the bowl. Add the remaining sugar in small increments as done earlier. Scrape down the bowl one more time. On Medium High speed, whip the frosting for 2 minutes until fluffy and thick. Frost the cupcakes using a medium cookie scoop and an offset spatula. For more decorative cupcakes, use a piping bag and decorating tips. 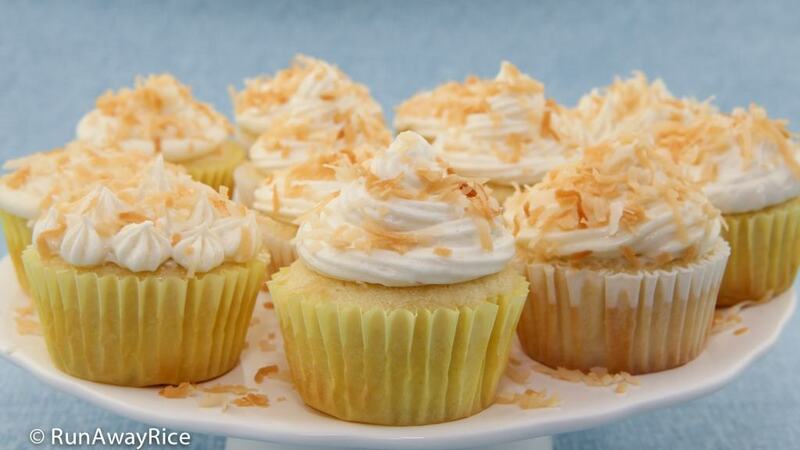 Top the cupcakes with a generous amount of the toasted coconut flakes. Enjoy the Lemon Coconut Cupcakes while fresh! In a large bowl, sift the confectioners' sugar. In the bowl of a stand mixer, add the cream cheese and butter. Start on Low speed and increase to Medium speed. Beat until well-combined and fluffy, approximately 2 minutes. Reduce to Low speed and add the vanilla extract. Add 1/2 cup confectioners' sugar and mix on Low speed until just incorporated. Continue adding 1/2 cup confectioners' sugar every 30 seconds while mixing. After adding about half the sugar, scrape down the bowl. Add the remaining sugar in small increments as done earlier. Scrape down the bowl one more time. On Medium High speed, whip the frosting for 2 minutes until fluffy and thick. Use a large lemon for this recipe. It should yield 1/4 cup lemon juice, but if less, add water to equal 1/4 cup. This batter is thin and that's what makes the cupcakes fluffy and moist. 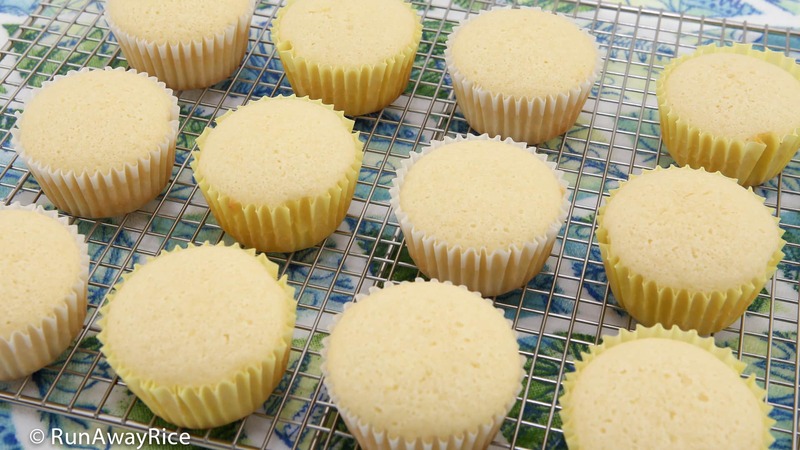 Avoid over-mixing the batter which may make the cupcakes tough or cause them to deflate after baking. After adding the eggs, the total mixing time should be less than 3 minutes. Add more confectioners' sugar if you prefer a thicker and sweeter frosting. If the frosting isn't stiff enough to pipe, refrigerate for 15 minutes. These cupcakes are best enjoyed the day they are made. Store any leftovers in the refrigerate for up to 4 days. Cupcakes can be frozen for up to 2 months. 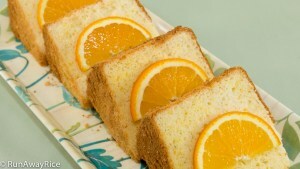 Hi Trang, thanks for your posting up again, will try how to bake this week. Hi Trang, these cupcakes look so amazing and I am so excited to make these for our Father’s Day cook-out this weekend. Thanks so much for sharing.